● metal plating copper products ● letter shape wall hooks ● increase the space smart admission ● Small fresh texture atmosphere /**Product Description and Story**/ Dailylike vintage zakka letter wall hook, is a good helper for living home layout, suitable for home, clothing store, studio, business space and so on, full of positive energy text, so that the space to live together, the most simple design, Help you string together the joys of life. /**Product Description**/ The letters are linked to: Hello, merci, Happy, Love, Wonderful, Home, Six sketches of text to choose from, please go to the page to buy. 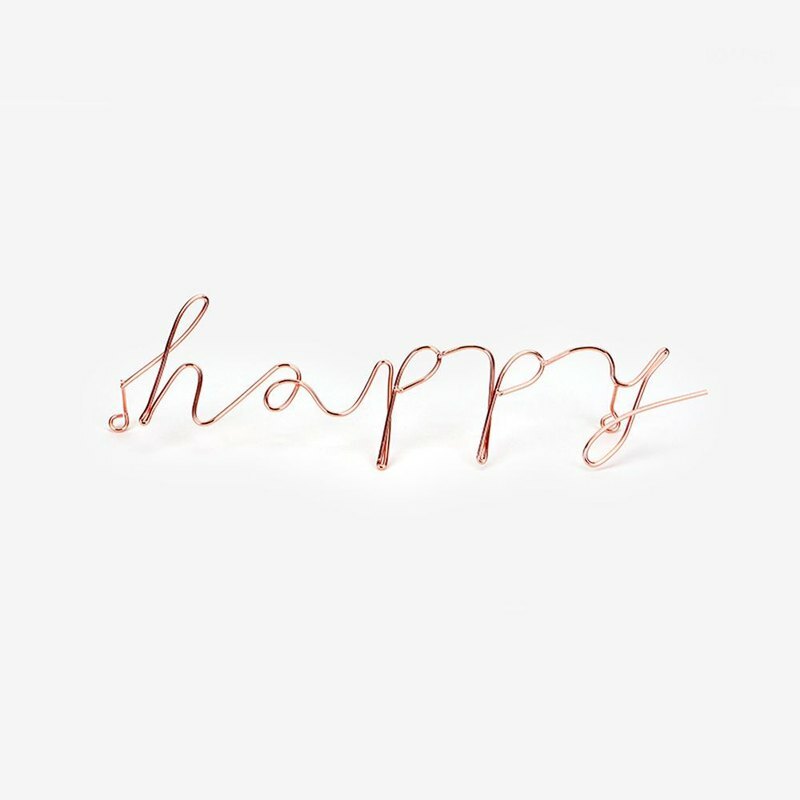 Material are all metal copper wire products, around the letters have a circle around the wall decoration. Letter shape wall hooks, so home atmosphere small fresh. Increase space, smart storage, hanging clothes hats, jackets are practical. A total of six letters linked to the wall, go to the page to buy. **【Style / Size】** 01 Hello-21.5x7x3cm / 02 Merci-30.5x4x3cm / 03 Happy-27.5x7x3cm 04 Love-21x6x3cm / 05 Wonderful-44x9x3cm / 06 Home-22.8x6.6x3cm **The style page** https://www.pinkoi.com/product/kLAR4auh?category=5 / https://www.pinkoi.com/product/KkgZxzX8?category=5 / https://www.pinkoi.com/product/jpXTSEcf?category=5 / https://www.pinkoi.com/product/fLd5tmqM?category=5 / https://www.pinkoi.com/product/veqpv8qm?category=5 / https://www.pinkoi.com/product/WmzrFEzS?category=5 **Precautions** Handmade copper wire, there may be a slight bend, please consider whether to accept the summer order to buy. Small part of the production of flake or uneven color as the normal phenomenon of non-flawed. This series of products can be used in the kitchen or bathroom, but please keep the indoor ventilation. With the longer use, exposure to moisture or air, corrosion resistance and copper plating are likely to have degradation. Recommended as far as possible well-ventilated place, wet exposure may shorten the service life of goods. / Product Size / 27.5x7x3 cm / Package Size / 28x8x3.5 cm / Material / Copper / Weight / 50 g https://farm5.staticflickr.com/4712/25721388728_00fd0dfa6c_o.jpg / Designer and brand profile / Founded in 2010, Dailylike is a Korean designer brand based on DIY materials. Dailylike comes from Daegu, the most developed city where fabrics are made in South Korea. With the current trend of European and American popular scrapbooking DIY, specifically for the DIY handmade fans tailor made. Dailylike team believe that the heart can touch everyone, our products from design to finished products, Through various checks, through serious attitude, create a happy work, so that everyone can enjoy the beautiful design of small objects easily. Dailylike hope that everyone can enjoy the good life in the United States and Japan through our design, and love every day, we are all together.